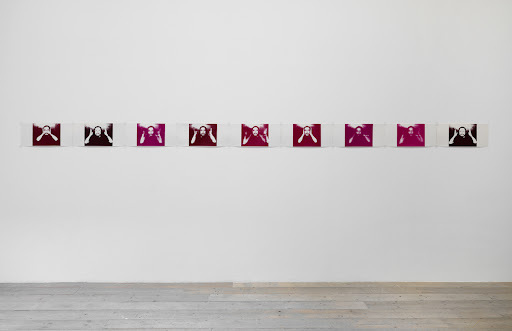 Aesthetica Magazine Blog: Pioneers of Sound Art: Gone with the Wind, Raven Row, London. The building was beautiful and it was light. The rooms are impeccably restored so that visiting the Raven Row gallery would be worth it, irrespective of an exhibition. The gallery is based on Artillery Lane, a street that could easily be missed unless you know where to find it, just off to the right halfway down Bishopsgate. Upon entry, it’s easy to overlook the labyrinth of rooms the place holds, as it takes a little exploration to realise there were other doors to open. Gone with the Wind is an exhibition that has been eagerly anticipated. What is so suddenly evident is how sparse the space feels. It’s performance after all, so the fact that the theme was bringing together three of the most influential pioneers of sound art meant you have quickly realise the immateriality is just as, if not more, important than the presence of any objects. Some of Max Eastley’s (b.1944) work was on show in the entrance, and also what was called the Shopfront Gallery. He is a musician at heart. Starting as a folk singer he had what can only be described as quite a severe swerve away from conventional music production to working with kinetics and sound objects while collaborating with other art students he met at Hornsey College of Art. The literature is proud to announce that an experimental album he made with his troupe was produced by Brian Eno in 1975. What is on show here are numerous sketch pads and notebooks, laid out under brilliantly polished glass cases that depict his past ideas and experiments. They are, by in large, scientific and diagrammatical but there is the unmistakable response to the importance of nature and its powers of creating sounds that can be manipulated and recorded to make entirely different things that have a life of their own. This almost modular landscape theme to the pieces gives them a feel, as if they had always been in the house, like artefacts that had been buffed for the occasion. On the first floor it’s easy to become submerged in the strange pieces that were not so much visual art, as a production of music without sound. There are Iron filings that move under their own accord beneath a fireplace holding a speaker and a magnet, and thin metal threads protruding from canvases that slowly hang and sway at their own pace to a seemingly random pattern. It is marvellous stuff and transfixes the viewer due to the sheer curiosity the pieces evoke. Where Eastley’s work lacked the sound element that was expected, the main ground floor space, taken up by Takehisa Kosugi (b.1938) gives more of a tangible taste of what some sound art consisted of, even if that is only in photographic form. Three walls are a photo album of his travels and sessions. Surrounded by wires, handmade stringed instruments, turntables and horns it looked as if he had a great time in the 1960s. Other works on show contain wires leading into minute black diodes that are connected to concealed batteries that clicked and buzzed in what can only be assumed to be intended harmony. There are interesting abstract pieces of score sheets with no music scribed, or score sheets that were lined with colour. His piece in the back gallery is involving, as you entered a space which can only be described as the white fuzz your television emits when something is not plugged in properly projected on to the walls so you become enveloped in a blizzard. Numerous dictaphones hang on threads, giving off white noise at various frequencies creating an impression of being trapped inside a minimal hissing world. It’s enjoyable and gives an element of life back to what at times is a lifeless show that concentrates too much on the methods and materials rather than the artworks themselves. The second floor holds work by Walter Marchetti (b.1931) which is largely performance based with the element of sound omitted. A member of a group that produced action-music-performances the work is extremely introspective and in many ways unclassifiable. Being a fan of the piano, the single work that must be seen when climbing all the way to the top of the building is the exhibition’s cover piece Musica da camera n. 182 made in 1990. A grand piano covered in lights that fill the room by not only its size but by its luminosity. It is the piece of work that sums up not only his work, but the other two artists in this show as well. You want to see what it does, sometimes you can bask in its light and simplicity, but ultimately you want someone to just play the thing. It’s a thoughtful, engaging exhibition in one of prettiest 18th century buildings in the east end of London. After a number of laps questioning the validity of the work, and the reason so much trouble was taken to produce so little, it becomes clear that the show is not about making a sound at all, but rather the process in which sounds can be used to create something altogether higher and more all encompassing than something solely visual. Gone with the Wind continues until 17 July. In conjunction with the exhibition, Raven Row will host a performance by artist Esther Ferrer this Saturday 25 June. To book and for more information please contact info@ravenrow.org. Did you check the 4th floor?